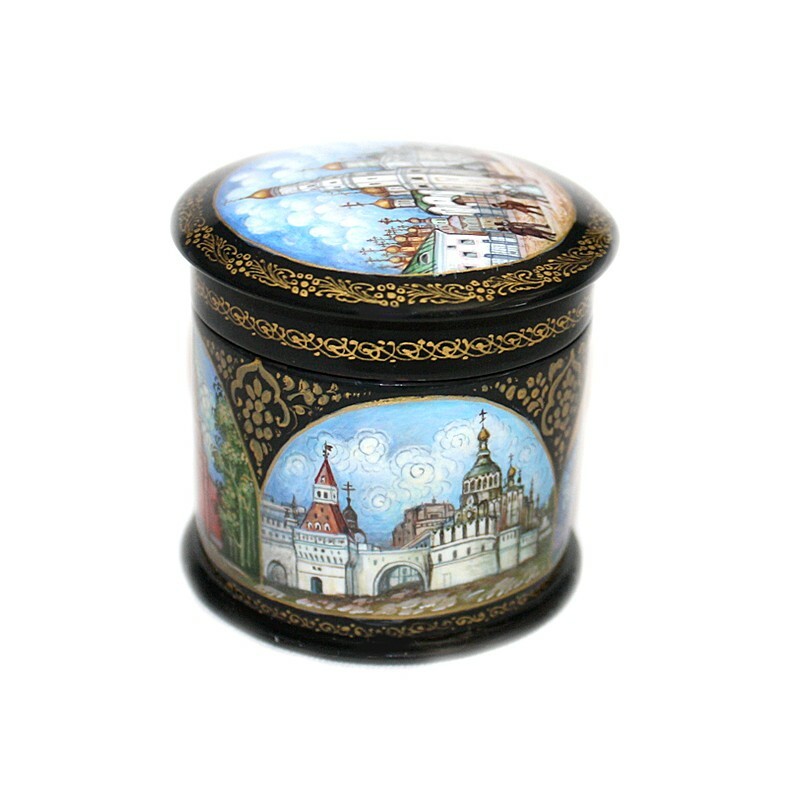 This small round box has been painted by Mikhail Strunin from the village of Mstera. 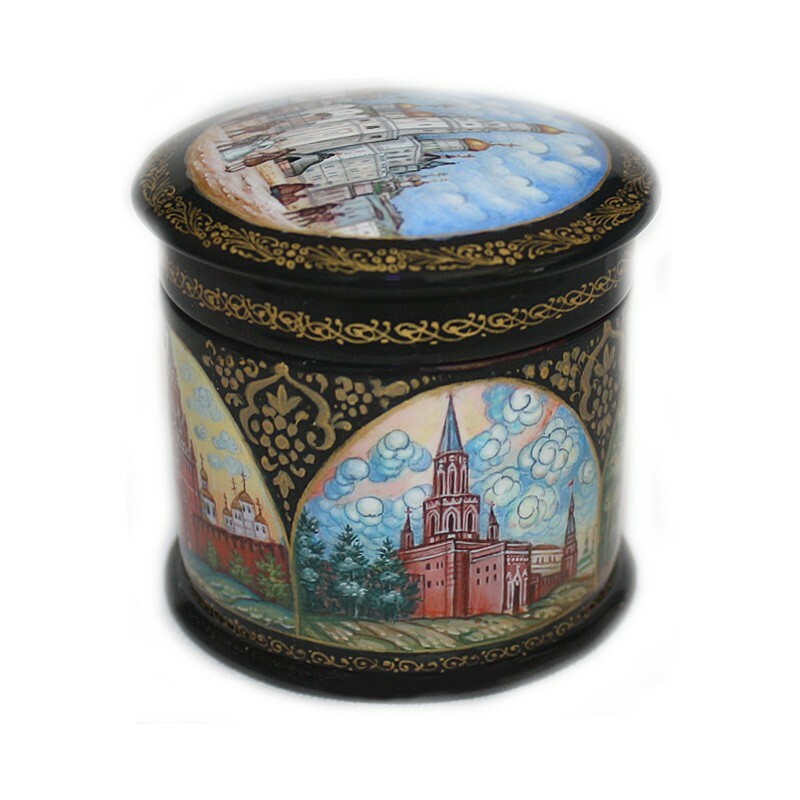 Most of all this artist likes to depict architecture; he has created many works dedicated to picturesque views of Moscow and St.Petersburg. 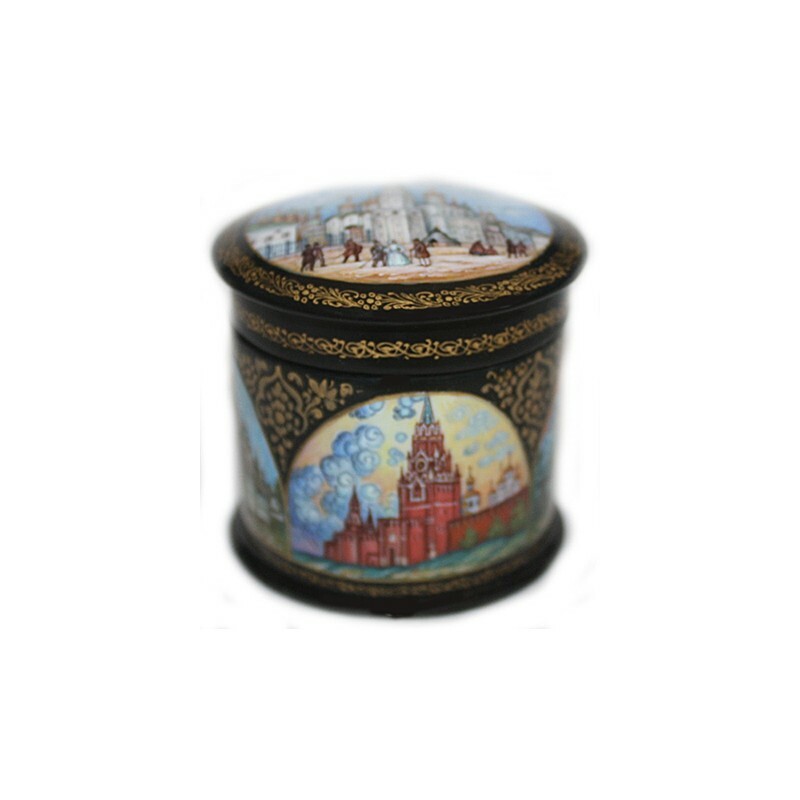 This box features the views of old Moscow; working on it Strunin used old paintings drawn in the 18th and 19th centuries. The artist has done tremendous working on this piece, as it features nine masterfully painted scenes. 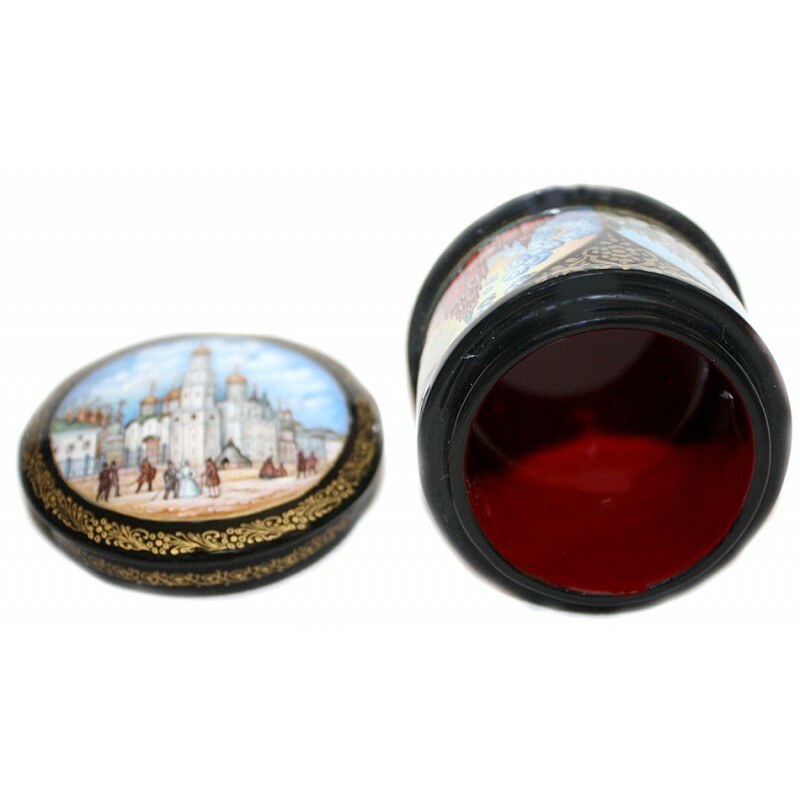 It has four extensive paintings around the body, one composition on the lid's top. 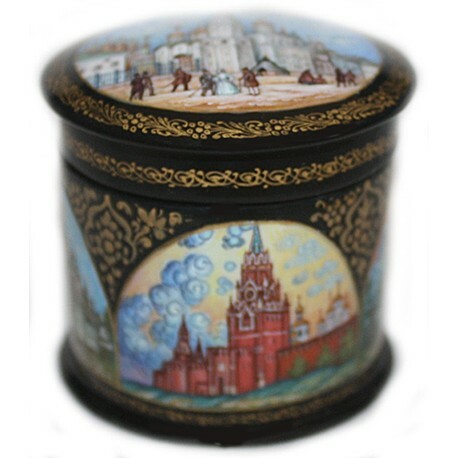 The depicted scenes show a grandiose panorama of Moscow Kremlin that can be observed by a viewer three hundred years ago, and everyday life of people who lived in this epoch. 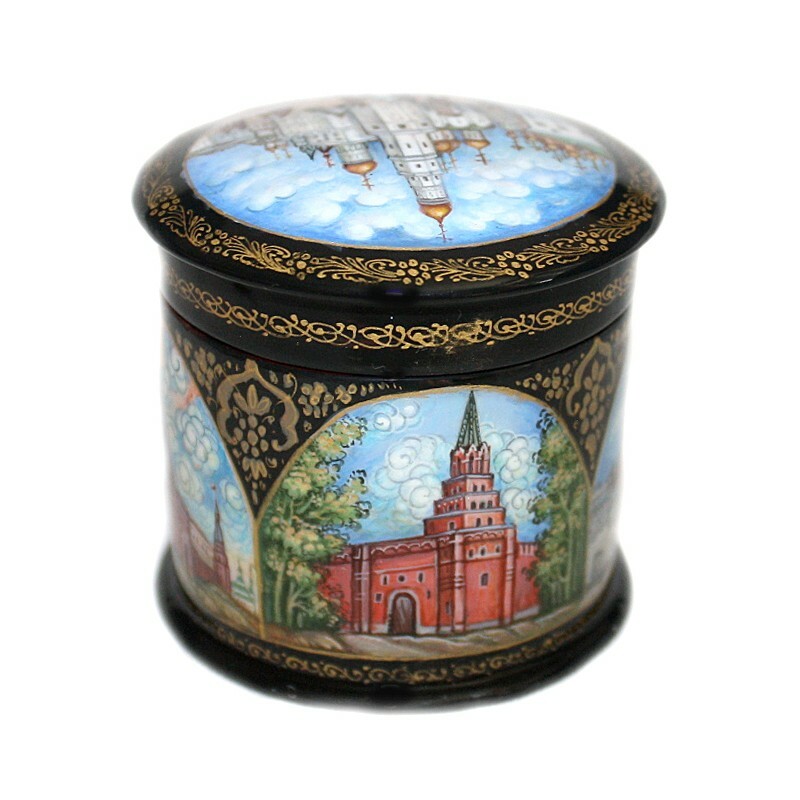 It helps to imagine how ancient Moscow looked like. 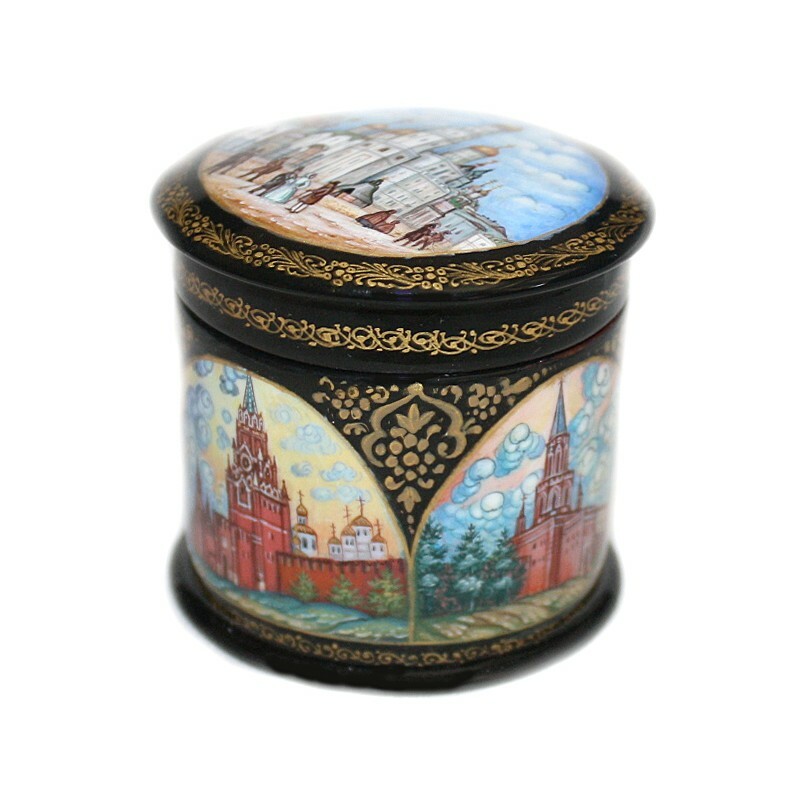 Looking at this panorama we recognize the white-stoned, golden-domed cathedrals of the Moscow Kremlin, the red-bricked wall with its numerous towers, the high belfry of Ivan the Terrrible, the monument to Minin and Pozharsky, the colorful St.-Basil's Cathedral, the Tsar Bell, and the so called "Lobnoe Place" or the place where executions were carried out. The scenes are painted in the traditional Mstera School palette filled with soft blues, greens, yellows, browns and reds. Some elements of architecture are detailed with gold paints but in very minimal amounts. 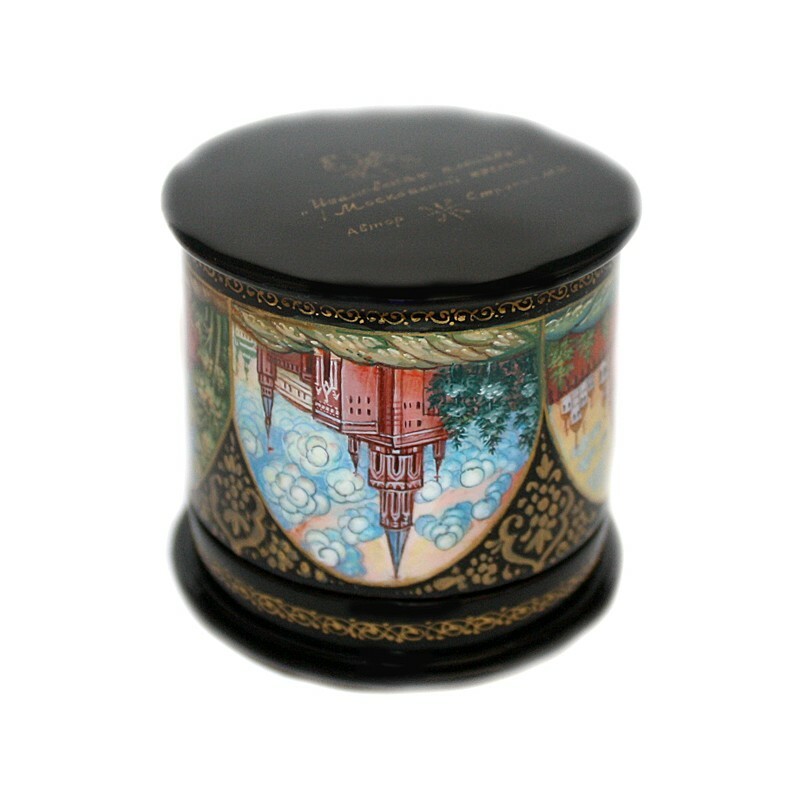 The box's exterior is decorated with fine golden scrollwork accompanied in certain places with silver dots. 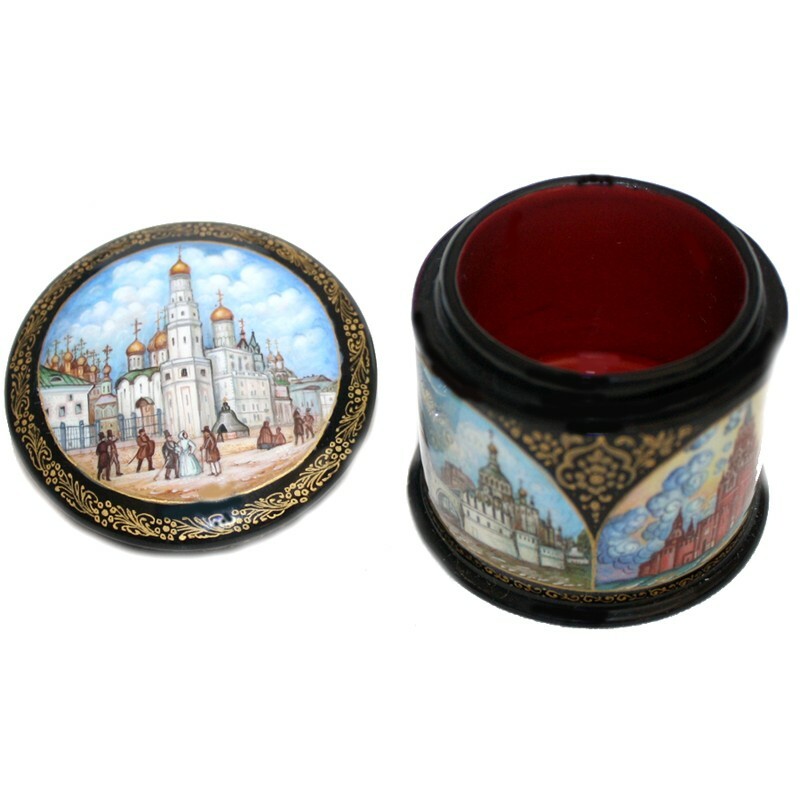 The box is made out of paper-mache. 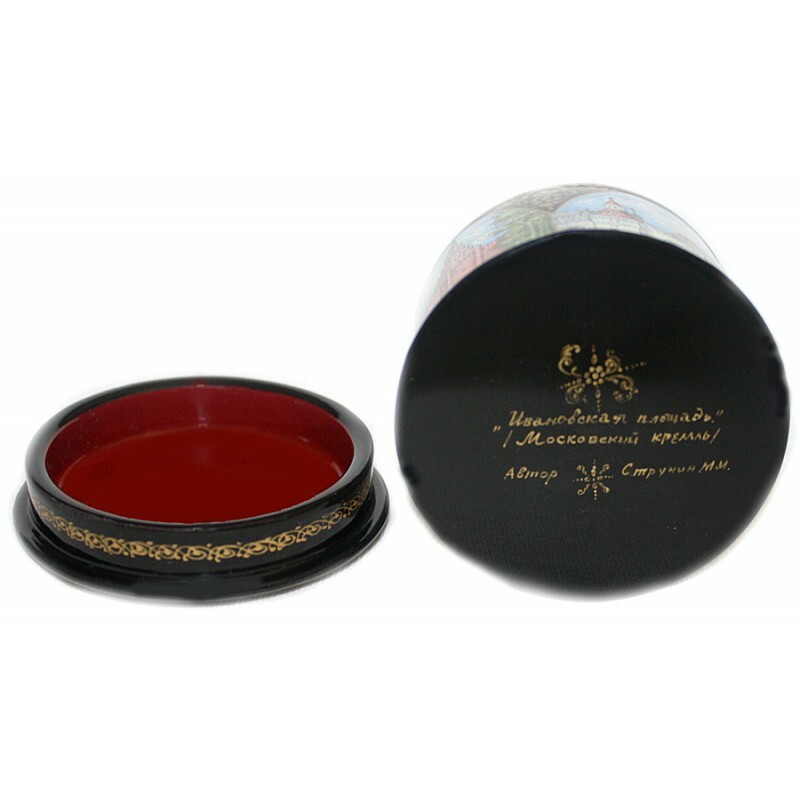 Black lacquer covers the exterior and red lacquer covers the interior of the box. The lid isn't hinged, and the box rests flat. 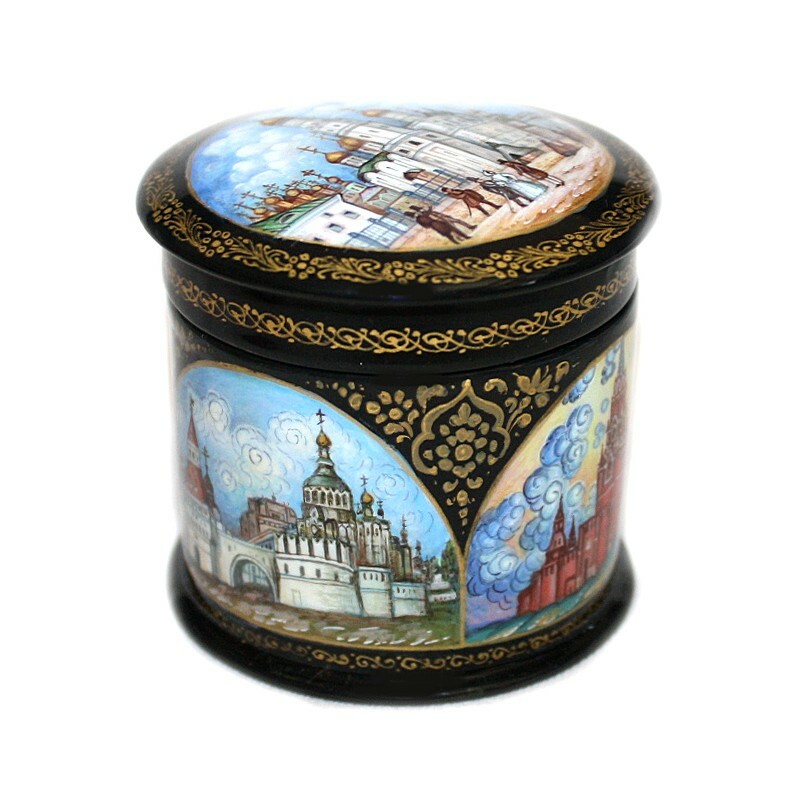 The work is signed with the name of the artist, the village of Mstera, the title ("Ivanov's Square") on the box's bottom in gold paints.